Many people who suffer chronic pain or ongoing injuries struggle to find a long-term solution. Sports Medicine Acupuncture is a revolutionary method of treatment that incorporates principals from both Western Sports Medicine and Traditional Chinese Medicine into a truly integrated system. It can succeed where other forms of treatment have failed. While a single treatment can help to relieve pain, it is not about trying to find a quick fix. 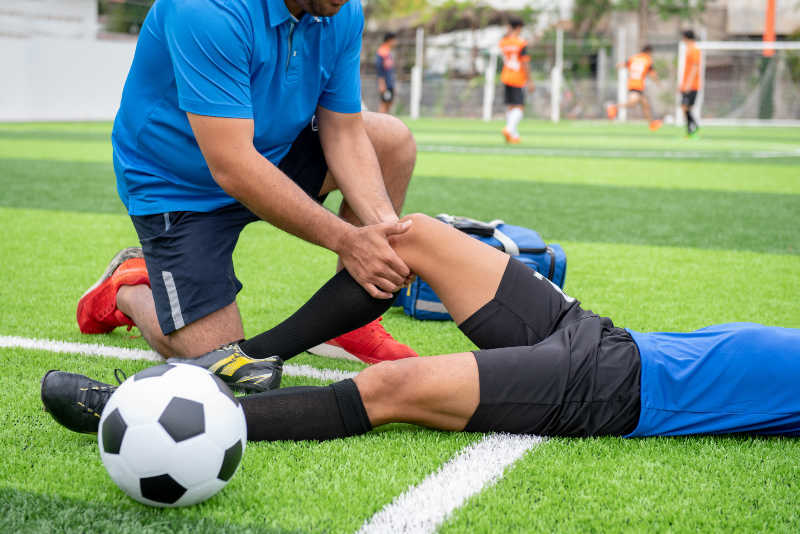 Sports Medicine Acupuncture doesn’t just focus on the symptom of pain; it also addresses the structural, postural, and muscle weakness problems that can be at the root of it all. While it was originally developed for athletes, the principles apply equally to all types of musculoskeletal pain. 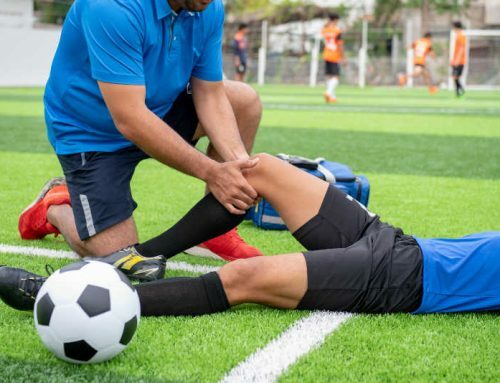 Sports Medicine Acupuncture is a proven, comprehensive method that helps to align and ‘retrain’ the body to function properly in order to remove the cause of chronic pain and injuries. Prolonged pain can be resolved, injuries finally heal, and potential future injuries can be prevented. In this article, I will address how to use this Sports Medicine form of acupuncture for hip pain. Fig. 1-A. Right weight-bearing. The image on the left shows the correct alignment of the pelvis. The right image is an example of a left pelvic tilt with lengthened and inhibited right gluteus medius and a right hip shift. Sports Medicine Acupuncture is different to traditional acupuncture in a couple of ways. First, examination incorporates postural and functional movement assessment and muscle strength tests to determine postural issues, dysfunctional movement patterns, and potential weakness of individual muscles. These factors can compromise proper function and lead to pain and injuries. 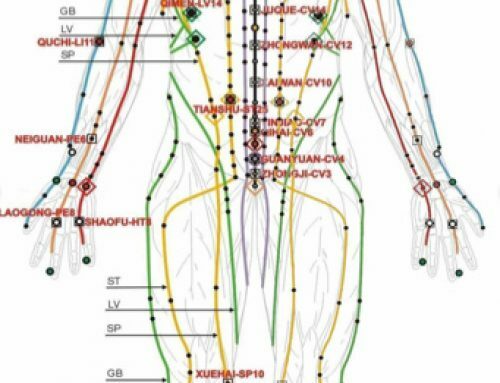 This information is combined with Traditional Chinese Medicine diagnosis and used to construct a comprehensive treatment, which incorporates motor point and traditional acupuncture, myofascial manual therapy, and corrective exercises. Sports Medicine Acupuncture combines the best from Western and Eastern models of medicine, bringing the best of both worlds together to create a comprehensive, targeted, and effective healing system. This short case study on acupuncture for hip pain explains the Sports Medicine Acupuncture approach. to a patient suffering from hip pain. Fig. 1-B. This image is showing a asymmetrical hip shift to the right during a squatting motion. The resulting imbalance was causing instability, which resulted in chronic strain and injury of the right hip joint. I performed Western orthopedic tests, which revealed no specific pathology of the hip joint. (She was referred for an MRI later that day to be thorough, but in the meantime I continued with assessment and treatment). 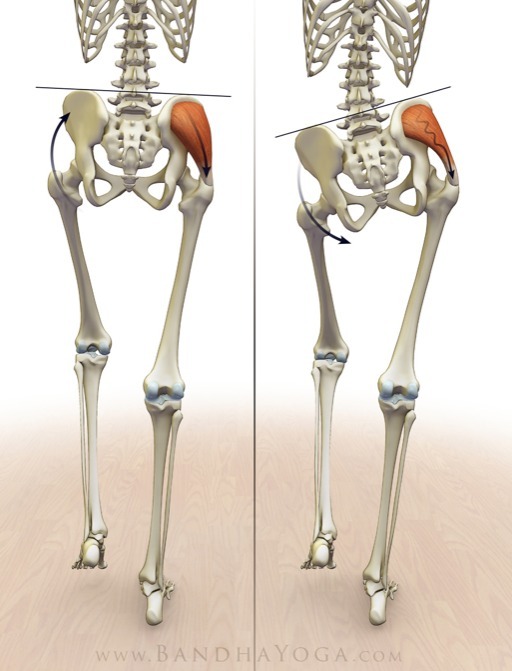 When I evaluated her posture, I noticed there was a left tilting pelvis, which results in the gluteus medius and minimus muscles on the right side being in a locked long and inhibited state (Fig. 1-A). When I asked the patient to perform a functional assessment of a slow squat (Fig. 1-B). I noticed that her hips shifted to the right and her right knee buckled inward. She found it difficult to maintain her balance. Manual muscle strength testing confirmed that the gluteus medius and minimus muscles on the right side were weak and painful to test. This weakness resulted in an instability and strain in her hip when she got up and down from a chair, walked up and down stairs, and even when she was just standing. The movements performed during examination aggravated the hip pain, but when I assisted her in correcting the dysfunctional movement pattern, it reduced the pain during movement. After completing a full assessment, her treatment involved correcting the postural and strength issues using the muscle motor points and acupuncture points to balance the sinew channels (jingjin), unique to Sports Medicine Acupuncture. The overall comprehensive treatment combined assessment and treatment of the patient and their injury for successful and long-lasting results. Immediately after treatment, the patient reported a significant reduction in hip pain, and better yet, the pelvis was now level, and the gluteus medius and minimus muscles were able to fully engage and maintain strength against resistance without pain. Now that the muscles necessary for correct movement are now proprioceptively functioning, she was prescribed corrective exercises to help improve her balance, strength, and alignment. We also discussed certain things she could change in her diet to help reduce inflammation and pain. While there will be a need for follow up treatments to completely resolve her pain and prevent further injury to the hip in the long term, she is finally on her way to healing and being pain-free. The assessment and treatment techniques discussed in this article on acupuncture for hip pain are taught in the Sports Medicine Acupuncture Certification Program. Dr. Jay Bulloch graduated from the Sports Medicine Acupuncture Certification Program in 2015. He can be reached at jaybulloch.com.